Home Quilting Tutorials Quilt Shop Or Chain Fabric Store? What’s The Difference In Fabric? Being a beginner quilter can be so overwhelming. The rewards of quilting are worth all the work, but when someone is just starting out there can be a lot to discover and look in to. One big thing to think about is the fabric. For all the beginners out there, I am sure you are busy trying to figure out the “how to” of quilting, but looking into quality fabric is also essential. After all, we all want to put our time into quilts that will be sustainable and can even be passed down through generations. 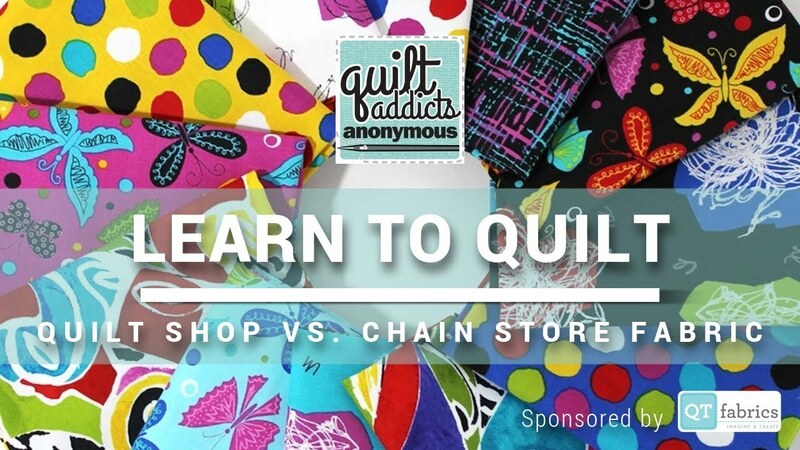 So, let’s ponder the question of chain store versus quilt shop fabrics. To make things a little easier, there is a video below the addresses this topic. The video is hosted by Stephanie from Quilt Addicts Anonymous and she has a special guest star, Ken from QT Fabrics. The video is so valuable because we actually get to sit down and get information from Ken, who has worked with fabric from his entire career. There is a lot to learn here and it’s so exciting! The most important thing about the fabric we use in our projects is its ability to hold the shape. With experience, we really can see the necessity of this, but for those beginners out there, it is less noticeable. Please learn from our own trails and look into these things before jumping into the first big project. The host in the video says it herself, the process is easier when starting with strong cotton. In the video, we get a sense of where this information is coming from because both hosts give us some background about themselves and where they learned these things. This is really reassuring, especially as a beginner who may not know exactly where to look for viable information. Check out the video, it’s extremely helpful! Even for more experienced quilters, there is always something to learn. Most importantly, do not forget to have a ton of fun with this rewarding process!